Good Course Design Should Take Into Account Several Factors. A well-designed course places a premium on safety for players and other park visitors. Don’t throw towards paths if possible. Design holes to play away from active areas. Fairways should never crisscross. Never play toward playgrounds. A fair course rewards good throws, punishes bad throws, and provides varying degrees of success for throws in between. Good course design doesn’t accentuate the element of chance. Placing targets too close to out-of-bounds areas can punish good throws and lead to frustrated players. Tunnel shots reward accuracy, but should leave room for good recovery shots for those who don’t execute the drive. A well-balanced course will have a mix of long and short, open and tight, left, right and straight fairways. Remember that players are both right and left handed, and throw backhand and forehand. Try not to string together holes that require the same shot over and over. The course should require a wide variety of different skills (shots) to avoid obstacles, to negotiate terrain challenges and to score well. Route players up, down and across terrain. Mix wide open holes with tighter fairways. Place baskets to the left, right and center of the fairway. More variety means players become well rounded playing your course. The design should cause players to put a premium on correct shot selection and placement. A par four hole adds more strategy than a par three. Save some strategic choices for your last four holes, where heated contests can be won. Course design should highlight the special features and inherent beauty of the land itself. Find a unique obstacle, tree, or land feature and create a great hole around it. A string of holes that utilize a unique aspect to your course can make it memorable. Emphasize the local flora on your course if possible. 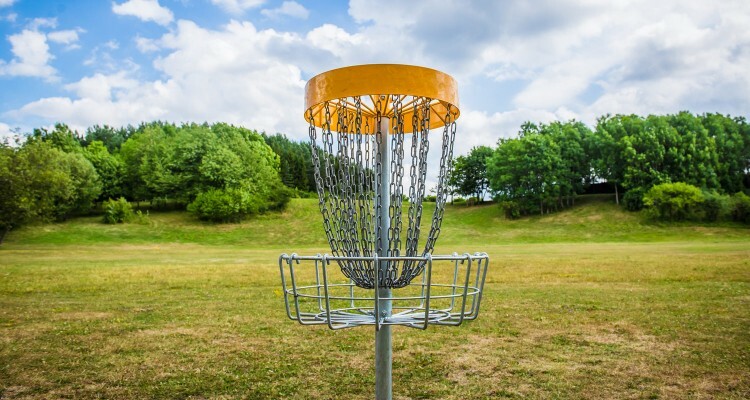 A good course designer has detailed knowledge of the flight patterns of modern discs, keeps up with trends in course design, and is familiar with top courses around the world.